The 9th Eurovision song contest produced one of the hugest victories recorded. 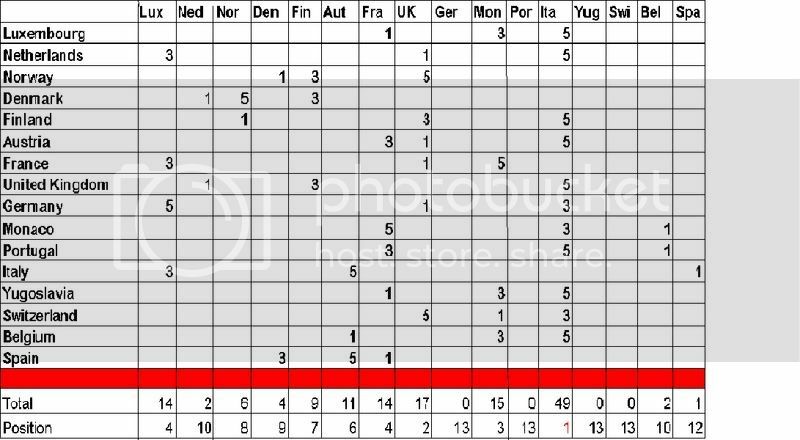 After years of producing big hits and not winning the contest Italy finally emerged victorious finishing an astonishing 32 points ahead of the runners up (United Kingdom). The voting changed again due to the controvesy of the previous year. This year the juries once again voted for their top 3 but this time giving 5, 3 and 1 points to those top 3. The margin of victory was so huge that it would not have made any difference what system was used the winner would have remained the same. Portugal made the most disastrous start to their Eurovision careers finishing with 0 points, a distinction they would hold alone for 30 years until Lithuania did the same.